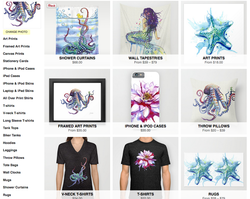 Each store below is stocked with a variety of print options and carefully designed products embellished with my artwork. 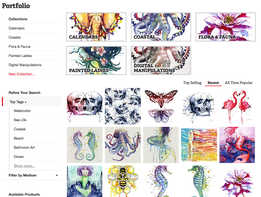 Art prints are kept within a similar price range between all websites, however you may see slight differences in cost due to size, material and quality. Etsy is the only place to purchase signed prints and original paintings. Follow me on Instagram & Facebook to see sketches and in progress work, as well as gain access to regular coupons and free shipping deals. If you are a retailer and would like to purchase prints at wholesale, ask me for my line sheet. I am an approved Etsy Wholesale Seller. Below is a preview and description of what is available on each site. Wholesale prints! Ask me for my line sheet! Signed Prints : The only place to purchase signed prints directly from Sam. All prints are personally handled, signed, and inspected for quality control. Fabric: 26 varieties of Knit, Woven, and Performance blends. Can purchase by the yard, fat quarter or test swatch.